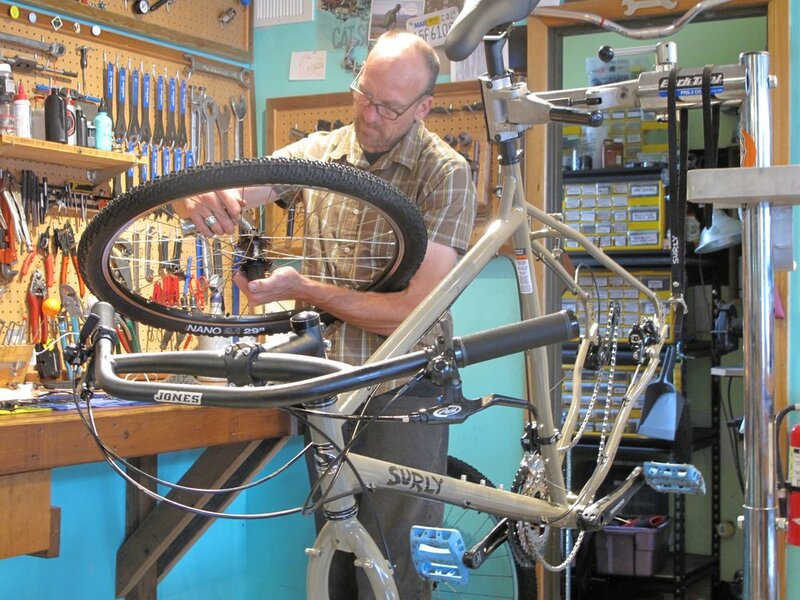 Cat Six is a full service bicycle and repair shop on 42nd Ave in NE Portland. Whether you're newly bike-curious or a seasoned daily rider, we'll do our best to treat you like a favorite customer. Or at very least a human being. Our specialty is bikes you can feel good about riding to work and then taking out for some fun on the weekends. We stock beautiful steel bikes by Surly, Masi, Marin, Simcoe and Pure City. Everything we sell is assembled with painstaking attention to detail and includes a year of fit consultation and mechanical service. Special thanks to the folks that have tooted our horn on Yelp, Google, Facebook and via snail mail! Kirk started working in bike shops in the ’80s, taught bicycle repair for seven years, and recently raced in a pink bunny costume. Kirk is Top Wrench, Ubermechaniker, and Leader of all things Service. Your bicycle will be restored to premium tuned-up condition by no green lackey or minimum-wage slave, but by Kirk Himself. Tim may look like the resident young guy, but his love and knowledge of the bicycle runs deep. He and Kirk first met in Santa Cruz, CA when the Bike Shop at School program was just getting started, and he's been at it ever since. From off-the-shelf bikes to esoteric vintage parts, Tim's your guy to chat with about your next purchase or project. And speaking of chatting, he literally wrote the book (well, thesis) on bike shops as community assets. Steve specializes in customer outreach, chasing pieces of handlebar tape, and finding new places to take naps around the shop. He commutes inside a cozy bag mounted to Kirk's Surly. If you bring in a stroller or trailer for repair, please check for feline stowaways before leaving the store.